Safety is a topic that should always be at the forefront of truck drivers' minds. Amanda Hall, Director of Safety for ASF Intermodal, a full-service intermodal and dedicated carrier with more than 300 trucks on the road, shares her insights on some of the most important safety tips for professional drivers to observe. Hall stresses that safety begins with the pre-trip inspection. She states, "The pre-trip inspection helps guard against mechanical breakdowns and accidents by insuring a truck is not only in safe operating order, but also compliant with state and federal regulations. A pre-trip should take approximately 15 minute and can save a driver time and money down the road." She reminds, "The pre-trip inspection is a driver's first line of defense during Department of Transportation (DOT) roadside inspections. Proper pre-trip inspections can prevent Compliance, Safety and Accountability (CSA) points for violations received during a roadside inspection. Roadside violations are visible on a driver's Pre-Employment Screening Program (PSP) report for three years. Many motor carriers are now using the PSP reports during a prospective driver's pre-employment driver qualifying process." Hall also urges drivers to avoid complacency. She states, ""Don't fall into the complacency trap if you are taking the same runs or following the same routes every day. Expect the unexpected." She points out, "Even familiar routes change based on travel patterns. Always pay attention to road signs, speed signs and traffic - especially during holidays and other periods of increased travel." She reminds, "construction zones and school zones are typically more congested and frequently have people working roadside. Accidents can occur in split seconds and can have lifelong effects." Hall states, "Drivers should avoid all distractions while driving. For commercial motor vehicle (CMV) operators, texting while driving is banned by the Federal Motor Carrier Safety Administration (FMCSA) and can carry a $2,500 fine for the driver and $11,000 for the company." Texting isn't the only possible source of distraction. Hall points out, "Many drivers are lulled into a false sense of security with hands-free technology. Conversations while driving, even when hands-free, are still a distraction. Even a simple cup of coffee or sandwich can be a distraction at times." It is critical for drivers to take care of themselves to avoid fatigue, a factor that Amerisafe indicates "can play a major role in accidents." Hall states, "Taking proper care of yourself enables you to deal more effectively with situations that may arise while on the road." It is critical to get plenty of sleep. Hall advises, "The key to fighting fatigue is a well-rested driver. During cold and flu season, be mindful of over-the-counter medications you take, as many of them cause drowsiness." Drivers must also comply with mandatory FMCSA hours of service limits and break time requirements. Hall points out, "FMCSA requires drivers have to take a 30 minute break they have been on duty for eight hours. It's important to note this break must be taken after a driver has been on-duty for eight hours, and not confused with driving for eight hours." According to Hall, "Truck drivers have numerous blind spots to contend with that the general motoring public are not aware of. One of the main blind spots is the right or passenger side of the truck. Because of this, related accidents and sideswipes are very common." She advises, "If conditions allow, driving in the right lane is a way to reduce right/passenger side sideswipe accidents." Hall emphasizes the importance of signaling properly when changing lanes. She advises, "Drivers should provide enough notification so all vehicles around them are aware of their signals." She points out, "When passing and changing lanes it is imperative to make sure that the lane change or vehicle pass can be safely executed. Misjudging speed and distance of other vehicles is a common cause of accidents." Truck drivers don't just need to be aware of other vehicles and the flow of traffic. Accidents can occur when animals dart on to the road. Hall states, "animal accidents are a significant risk to truck drivers." To help prevent these types of accidents, Hall advises drivers to "be sure their headlights function properly and watch for everything on the side of the road in addition to traffic." TruckerToTrucker.com advises drivers to always be mindful weather conditions, road conditions, and other risk factors that can impact safe vehicle operation. Hall points out that factors like load weight, weather and terrain impacts how a vehicle must be operated for maximum safety. To illustrate, she states, "A fully loaded tractor trailer weighing 80,000 + pounds is going to take longer to come to a complete stop versus a bobtail tractor" (which is the tractor alone, with no trailer attached). Hall advises, "Drivers are responsible for making sure their truck is properly maintained. 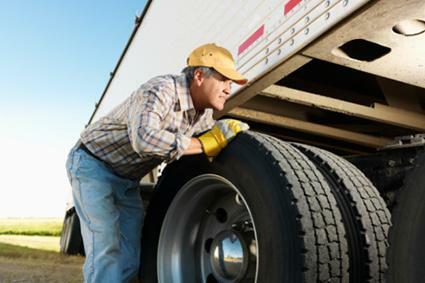 Tires, lights, and brakes are common CSA maintenance violations. Regular maintenance and quarterly safety inspections can help to identify potential problems before they become an issue down the road." American Trucker advises drivers to consult their vehicle's maintenance manual, also taking into consideration distance driven and wear and tear. Drivers may need to use various safety-related supplies during their trips. Hall states, "FMCSA requires commercial vehicles to be equipped with a charged, secure fire extinguisher as well as emergency triangles. Many drivers find carrying a flashlight, small tool kit and replacement fuses and lights to be very helpful." Following these tips and observing all FMCSA and DOT regulations can help truck drivers maintain optimal safety on the road. Hall also cautions drivers, "Make sure to complete the necessary self-certification forms required by your commercial driver's license (CDL) issuing state when filing your medical card with the state. Lack of proper paperwork and errors can cause a driver's CDL to be suspended and result in a costly shut down during a roadside inspection."